Load up and roll out! Its maximum balance and physics in this heavy duty all terrain transport and race game. 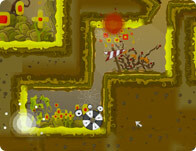 Get to the end of the level in time, deliver your load and over come obstacles and pitfalls all along the way! Arrow Pad: Balance, accelerate, reverse.